Day 1: Web Application Designing. Day 3: Live Inhouse Application Development. Day 4: Windows ADO.NET Application Development. Day 2: Web Application Designing in Java. Day 3 & Day 4: Project Documentation. Day 5: Windows ADO.NET Application Development. Day 6 & Day 7: Live Application Design / ADO.Net Integration. Day 8: Template Designing - Live Template Designing. Day 9 & Day 10: CSS Integration, Live Migration Activities. 1.Internships can help students to identify career paths. 2.Internships allow students to know whether or not a career fits with their passion and interest. 1.Internship program aims to widen the student's perspective by providing an exposure to real use of technologies as expert. 2.During the internship, the students will have the opportunity to participate in the dynamic technical environment. Our internship program enables interns to work on live technical and business projects which are running on Australia, Canada and India. The projects range from application development to business consulting, in practices that include Corporate Planning, Education & Research. Enterprise Solutions, and Infosys Labs, the research and innovation group. All of you shall be trained by KaaShivinfotech MD on live who got award Microsoft Most Valubale Person (MVP) award and experienced more than 10 years in IT field DotNet expert, Testing expert. Our internship is an excellent opportunity to gain hands-on experience in an industry of your interest. 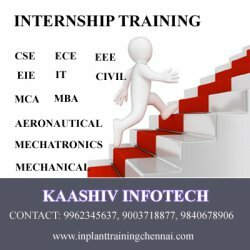 It provides the intern with the chance to learn the complete mechanics of a particular field, and determine whether we will help you to fill knowledge between school or university and the professional world.